Snow is on the way, and it’s time to go sledding! Here is a comprehensive list of places to sled in the western suburbs. 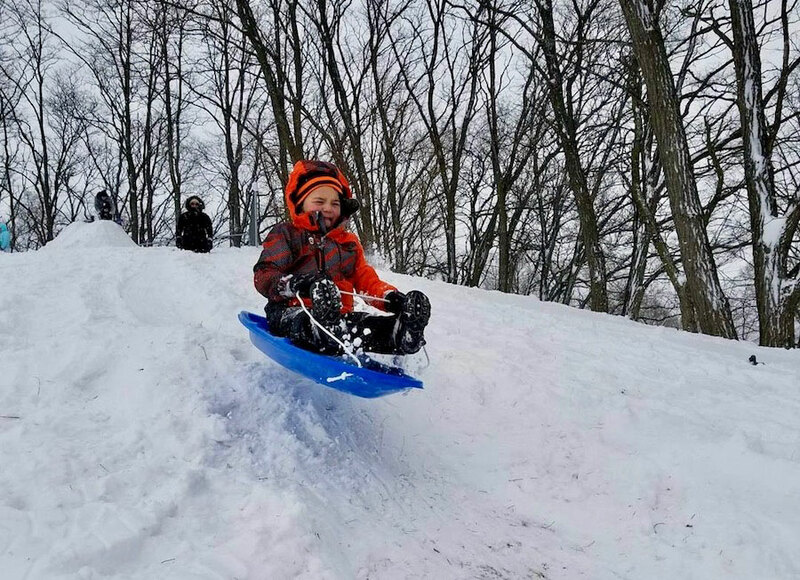 Grab your snow gear and head to one of these local sledding hills. Most locations will be open with at least two inches of snow accumulation, and many spots have lighting, so the fun doesn’t have to stop at sunset. 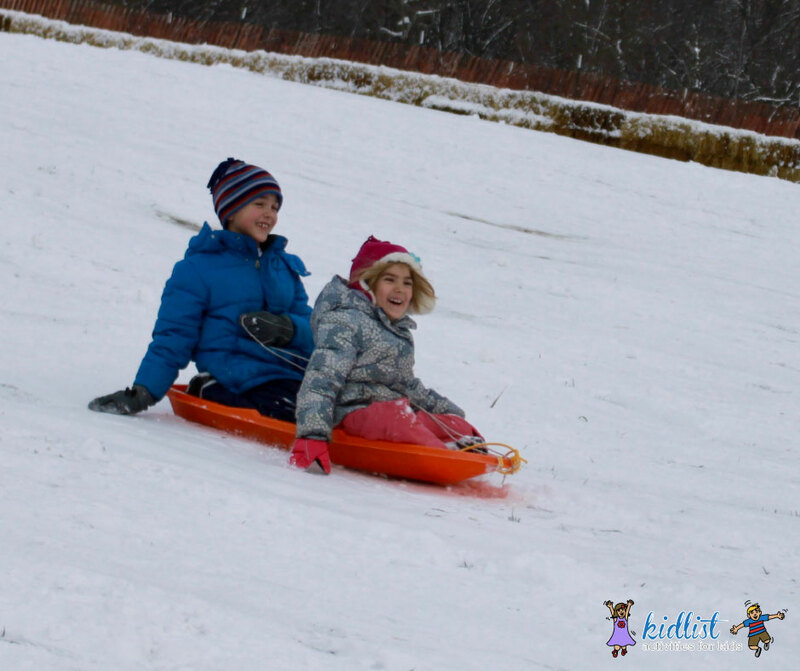 Try a new sledding hill and let us know what ages you think it’s good for! We would love to add your comments. You can also sled behind Madison School (601 S. Madison Street). It’s a little steep, but great because there aren’t any obstructions on the way down and it is completely clear at the bottom so you don’t have to worry about running into anything. Fun hill! Depending on the snow quality it’s possible that your kids could slide across a side road that goes in front of the library, so be cautious. Located in Center Park West, this sledding hill was renovated this year (2018) and has ample parking nearby. There is a small parking area near the overpass and the hill features a walking path up the side. Great hill for multiple age groups. There is a path for walking up the hill to the side of the sledding area for safety. The hill is pretty long with bales of hay at the end for extra safety. There is a small gravel parking area under the bridge at the base of the hill. 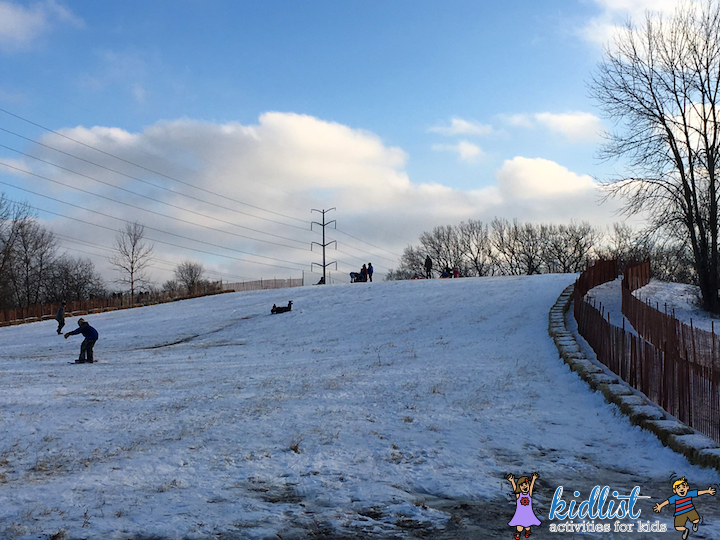 This park has two areas that are good for sledding, a gradual hill good for first time sledders right next to the parking lot (pictured above) and a short, steeper hill between an equipment building and the soccer fields, south of the parking lot. This hill is long and gradual. It’s a nice ride down and a moderate walk up. 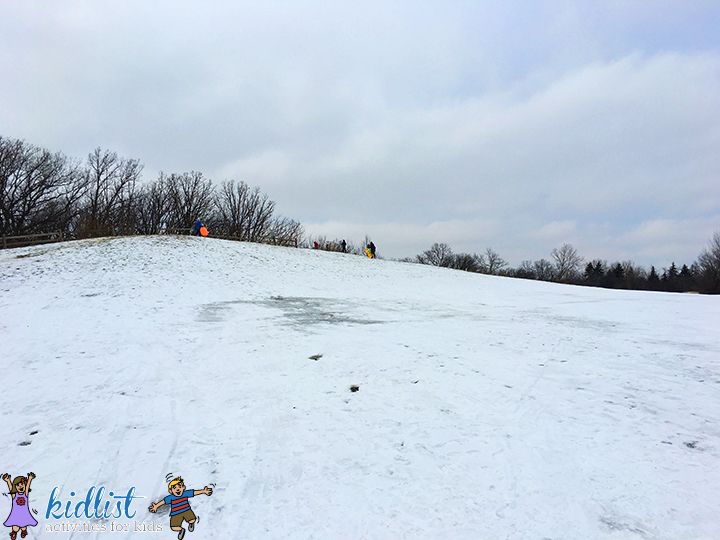 A popular sledding spot because it has a steep hill with stairs on the side that are used for exercise during the warmer months. The hill has lighting is open for sledding when there is 6 or more inches of snow. They recommend you call ahead. Click here for more information on this adventurous alternative to sledding, including age requirements, hours, tube rental, and tips. 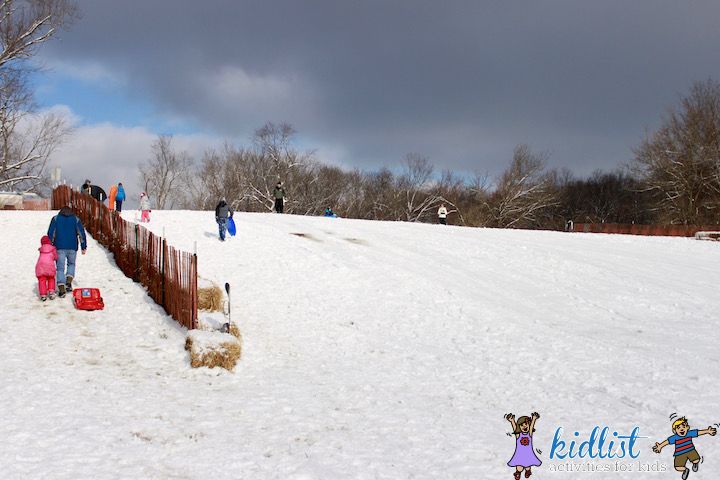 We would love to hear your comments and recommendations about the sledding hills above! Any insights to make a trip more fun? Don’t see your favorite spot listed? Share in the comments below. Also, you can find more great sledding locations in the southwest suburbs. 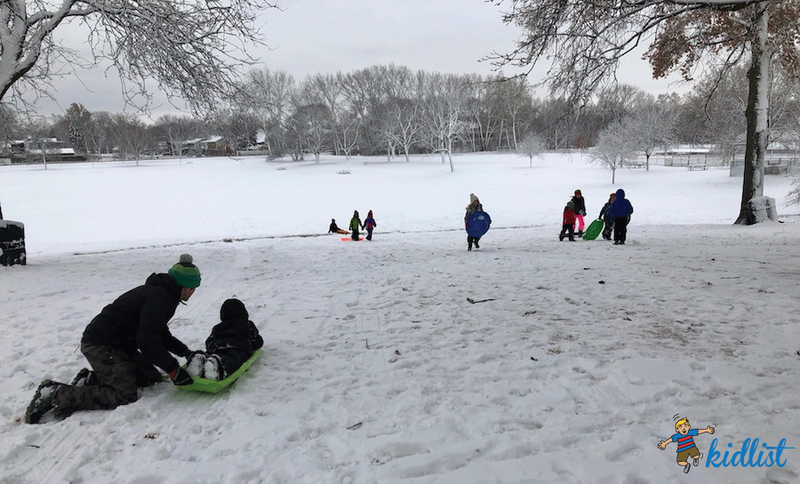 Click here for our list of Best Places to Go Sledding in Chicago’s Southwest Suburbs. Or, find more outdoor fun throughout Chicagoland. Be the first to comment on "Grab Your Sled and Head for These Sledding Hills in the Western Suburbs"